Mughlai cuisine represents especially the North Indian cooking styles. The taste of Mughal cuisine is often associated with a distinctive aroma. Mughlai dishes are rich, creamy and mildly spiced dishes. This is one of the dishes which i prefer to make when i have guests, as it is rich enough and very easy to prepare. 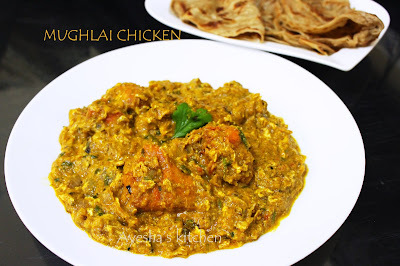 This recipe of Mughlai chicken gravy is inspired from one of the television cooking show 'Flavours of India', and i made few changes to suit my tastes. Eggs are added in this gravy which makes this dish more unique in texture and flavor. What else needed for a perfect gravy. It was pretty awesome..No words to express my feelings..A chicken gravy which is rich, creamy with some sweet, less spicy and a smoothy texture,.. 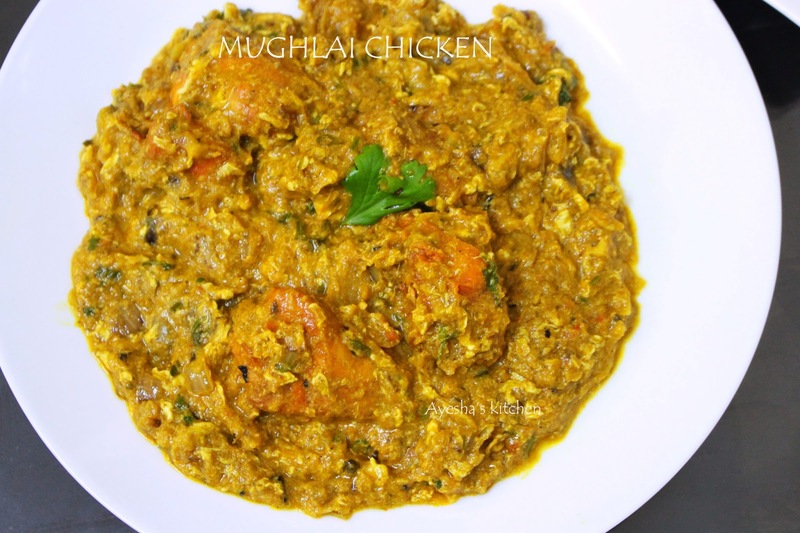 So lets see how to make creamy Mughlai chicken at home. Here is the recipe..Do try this mughlai classic chicken recipe..
Marinate the chicken with 1 tsp of chili powder, salt and set aside. Heat a wok with butter and add the marinated chicken. Toss the chicken well in the butter for few minutes. This makes the chicken soft and tasty. To the sauteed chicken add the onion paste ( 1 onion+ ginger+ 5 garlic cloves cooked in some water and then blend together to a fine paste for the onion paste ). Toss the onion paste with chicken well by increasing the flame. Stir continuously. When done, add garam masala powder and salt if required. Stir continuously until the oil float on the top. Now add kasuri methi leaves and half tsp of chili powder. Mix well. Now add half a cup of water and let the chicken cook well. When the chicken becomes tender, add the desiccated coconut to it and mix well. Then add khoya (i skipped adding this) and mix well. And at this stage i added half of an onion chopped sauteed in butter and then mix with the gravy (its optional only, i added to suit my taste only). Now add the fresh cream and cook for two minutes. Stir continuously. To this, add the whisked eggs and toss very well continuously until the gravy thickens. When done transfer to a bowl and garnish with dry fruits, cream or cilantro. Serve hot with butter nan / parotta / fried rice,,,..